But my horror was twofold. The first misery came as I heard the names and numbers of victims and thought about the pain they and their families will endure for the rest of their lives. The second dose came as I held my breath, hoping and praying the media wouldn’t amplify the violence. They ranked him against other “successful” attackers. Public shootings are a contagion. And the media are consistent accomplices in most every one of them. The Boston Bombing is a bit different than a mass shooting. The Tsarnaev brothers weren’t motivated by fame or trying to “outnumber” past killers. Terrorist attacks of that sort aren’t fueled by that. In this case, the brothers were motivated by extremist Islamic beliefs and a deep hatred for America. But, nevertheless, Rolling Stone‘s cover still glamorizes the attack. Future potential terrorists won’t see it as further incentive to attack our country (as noted above, that’s not what incentivize them), but other madmen may. Future potential mass murderers may see the cover and think that they could one day find themselves on there as well. What kind of message is that for Rolling Stone to send? The story has a number of interesting details about Jahar and his brother’s decent into radical Islam. It’s worth reading and provides an invaluable look into their lives. 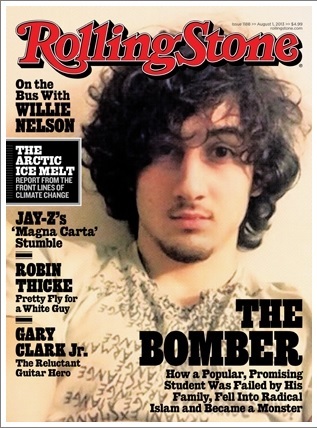 But there is no reason for Rolling Stone to put Jahar on the cover whatsoever, especially not a glamour shot of him. The less we do to spotlight terrorists and mass shooters while still investigating stories, the better. With its recent cover, Rolling Stone failed mightily.